Are you an instructor? Do you need instructor materials? Request an access code. 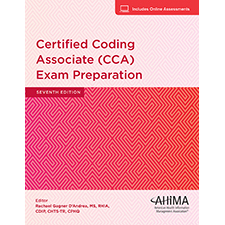 Certified Coding Associate (CCA) Exam Preparation provides ICD-10-CM/PCS and CPT practice you need to face the CCA certification exam with confidence. The practice exams and practice questions included on the online assessments simulate the exam experience and provide opportunities to apply your knowledge and skills.